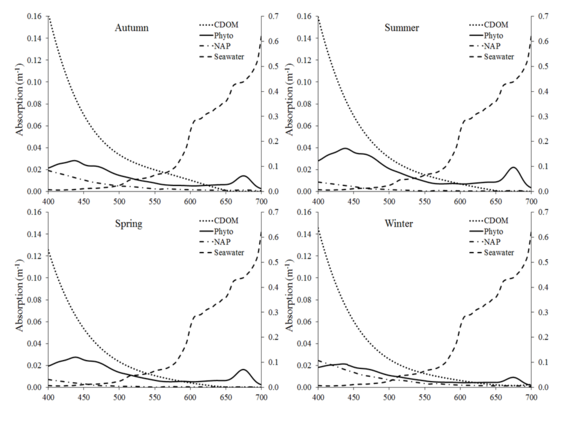 The relative contribution of aph, aNAP, aCDOM and seawater to total light absorption at station L4 varied by wavelength and between seasons are shown below. At 443 nm, aCDOM is the highest absorbing component in the water column in the blue region of the spectrum during spring, summer, autumn, followed by aph. In winter, aNAP can be as high as aph. At this wavelength aCDOM varied by an order of magnitude between 2009-2010 from 0.009 to 0.139 m-1, but in winter and autumn, mean aCDOM was 3.4 and 2.9-fold greater than aph. To use these data, and the entire series, please contact Dr Gavin Tilstone.